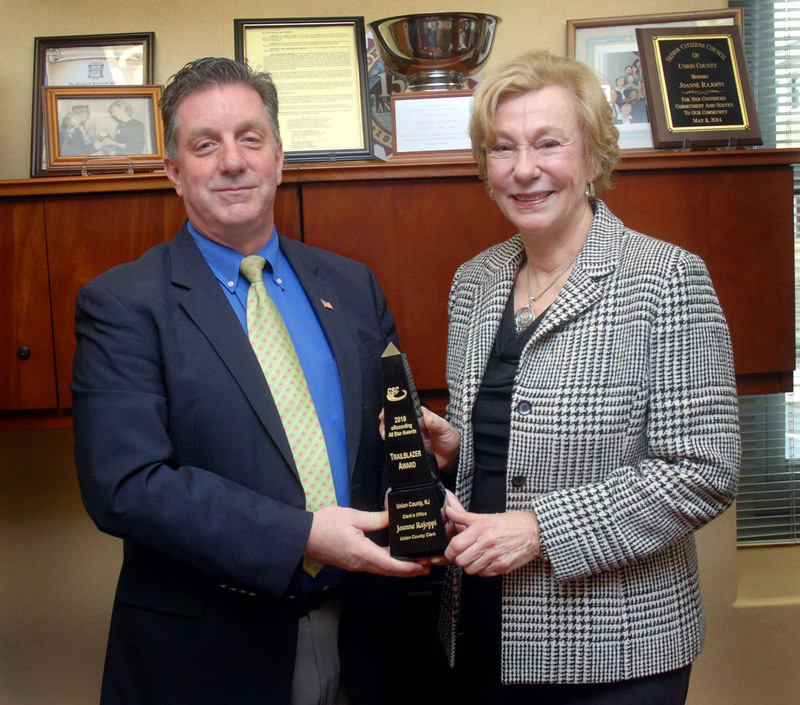 Union County Clerk Joanne Rajoppi has been formally presented with the national 2016 eRecording All-Star Trailblazer Award, for demonstrating leadership in the use of electronic recording technology. The competitive award is sponsored by the global business solutions company Corporation Service Company and was presented to Ms. Rajoppi by company representative and National Account Manager Joseph DeLuca at the County Courthouse last week. Corporation Service Company reviewed 1,200 eligible counties for the 2016 awards. Union County was one of only five counties selected in four different categories. The Trailblazer award recognizes a recording office that has established itself as a state leader in promoting the use of eRecording. In 2016 Ms. Rajoppi’s office electronically recorded 9,723 documents, far surpassing the total of 7,425 documents in 2015. “The growth of eRecording in Union County also reflects the eagerness of our community to take advantage of new technology that offers convenience and 24/7 availability,” said Ms. Rajoppi. In addition to becoming an early adopter of eRecording, Ms. Rajoppi was the second County Clerk in the country and the first in New Jersey to introduce a free mobile app for voter information, called Union County Votes. Last fall Ms. Rajoppi also introduced a new website, unioncountyvotes.com, to help ensure that voters and election followers can access information quickly and conveniently.